Today's update Version 2.2 adds In Game Achievements Via HeyZap.com. There are now 9 different achievements to acquire, and more are on the way. Also I have added a Drunken Notes activity for future laughs. You can make a note of the friends that are playing and where you are at and it will automatically time and date stamp each note. Each note is saved and can be overwritten at any time. The last thing I added in this update was a new dice color. You can now access red, white and the new blue dice in the settings menu. Here is a list of the new Achievements that are available via HeyZap. Someone rolled into $#%@ Man! 12 drinks! 3 $#%@ Man's rolled in one Game! 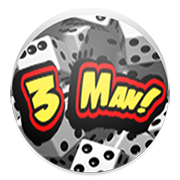 Three $#%@ Man's rolled in one game, sounds like a party! 25 Doubles Rolled in One Game! 25 Doubles Rolled in One Single Game! 10 Doubles Rollbacks in One Game! 10 Doubles Rollbacks in One Single Game! Sounds like a great time! 3 Doubles in a Row! 3 Doubles in a Row! You got to make a rule! 2 Extra Rules in One Game! 2 Extra Rules in One Game! Get the party going! 3 Extra Rules in One Game! 3 Extra Rules in One Game! Now that is a lot of drinking! All 4 Extra Rules in One Game! Unlocked All 4 Extra Rules in One Game! Maybe it is time for a water break? Wrote your first Drunken Note! Hope it was a memorable one!